Why Should there be a Jayanti for Tipu, the Tyrant? The decision of Karnataka’s Congress government to celebrate the birth anniversary of Tipu Sultan has come in for scathing criticism from a wide section ofpeople in the state and elsewhere.Even the High Court in Karnataka has questioned the logic and justification behind the 2015 decision by the Siddaramaiah government.“What is the logic behind celebrating TipuJayanti? Tipu was not a freedom fighter, but a monarch who fought the opponents to safeguard his own interests,” said Chief Justice Subhro Kamal Mukherjee. The Chief Justice made this observation during the hearing of a petition filed by a Coorg resident. 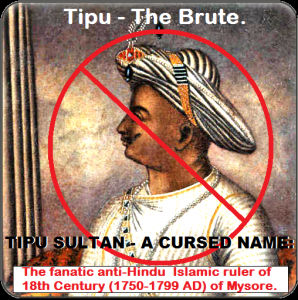 The petition challenged the government’s decision and said that Tipuwas actually a religious zealot and a tyrant who forcefully converted or mercilessly butchered Hindus and Christians.In reality, who was Tipu Sultan who is described as a Tiger of Mysore and projected as a great freedom fighter? History books, sponsored by the successive Congress governments and written by the so-called leftist intellectuals, would have us believe that Tipu was a great warrior and fought against the British.For the left-leaning historians, it was always (and still is) fashionable to eulogize Muslim rulers and fanatics because of their warped thinking. The Congress Party, which ruled the country for the first three decades uninterrupted, aided and abetted the distortion of our history books to please the Muslim populacewith an eye on their votes. Though Muslims constitute less than 15% of the total Indian population (but their numbers are growing quickly as against a slower growth of other religions), their votes have often been crucial in deciding the winners in many constituencies because they have a tendency to vote en bloc for the political party that is amenable to their communal demands.Though the Hindus constitute an overwhelming majority in India, their votesgenerallyget splitbecause they are too secular and would never vote on religious lines. Meanwhile, the Congress Party has always been willing to stoop to any level to come to power and ensure the survival of the Nehruvian state with its pronounced Muslim bias and clear antipathy towards Hindus. Historical records and books of the time have ample evidence, which shows that Tipu massacred thousands of Hindus and Christians in Karnataka and Kerala. He also ransacked hundreds of temples and destroyed many churches in these two South Indian states. In fact, early in his career, he took the help of the British to plunder and invade Indian kingdoms. Later, when the British decided to side with the local leaders (to suit their own interests), Tipu fought the English East India Company with the help of the French. Here it needs to be emphasized that Tipu fought against the foreign powers, not because of any love for his country, but solely with the selfish motive of establishing Islamic rule all throughout. When he invaded Malabar, he forcibly converted thousands of Nairs and Thiyyas.Those who resisted were tortured and put to the sword. Their women and children were taken away and given as slaves to Muslims.To the non-Muslims, he offered the choice between “the cap” and “the sword”. Many did convert to Islam in the Malabar region, as a result of which today one can see a large concentration of Muslims. Tipu wanted to subjugate the whole of Kerala and made Palakkad his base. The Hindus of the region fled to Travancore in their attempt to escape from Tipu’s cruelty and brutality. This made him turn his attention to Travancore.When his father Hyder Ali died, Hindu chieftains and warriors asserted their independence in Kerala. When Tipu succeeded his father to the throne at Srirangapatnam, he wanted to teach a lesson to those who had revolted earlier. However, Travancore was under the protection of Lord PadmanabhaSwamy of Thiruvananthapuram. All the Rajas there were ruling the kingdom on behalf of the Lord. When Tipu moved his army to the south, he tasted his first defeat near Aluva.The British, ever so cunning, saw an opportunity here and moved towards Tipu’s capital, with the help of the Nizam and the Marathas. Tipu had to rush back to Srirangapatnam. Unable to fight the combined might of the enemies, he sought peace because of which Hindus of Kerala were spared further brutalities. When the combined forces put a siege on Tipu’s capital, he panicked. He wanted the support of local Brahmins and other Hindus. To ward off bad times, he is reported to have offered pujas and is even said to have fallen at the feet of Hindu sage, SringeriShankaracharya.This desperate act of the zealot is highlighted by the “liberal” historians to project Tipu as a secular king who believed in Hindu Gods and sages! Tipu was also responsible for the large-scale massacre of the MandyaIyengars, and Kodavas of Mangalore. He was so inhuman and fanatic that he ordered the circumcision of even dead soldiers. During his reign of Coorg between 1785 and 1790, he destroyed more than 600 temples there.Several prominent Kannadigas have voiced their opposition to celebrating TipuJayanti. It is like “celebrating the anniversary of Aurangzeb, who was a tyrant Mughal emperor and staunch religious fundamentalist,” said Mohandas Pai, an eminenteducationist. Noted historian RamachandraGuha saidthere shouldn’t be a celebration of a monarch or for that matter any kind of feudal lords. Emphasizing that such celebrations are a waste of money, popular writer Shashi Deshpande said they are just politically motivated and done with an eye on the vote bank. Even the United Christian Association in Mangalore is against any celebration. It pointed out that Tipu forcibly converted Catholics and destroyed churches during his reign. This entry was posted in blog on November 9, 2016 by admin. More people talk about politics, more politicians start using religion as a tool. People must stop discussing politics and concentrate on individual achievement. What is wrong in celebrating Tipu Sultan if you can declare holidays for Sikh gurus and martyrs. Modi is the one who is polarising India and not Congress. This is a good take on what is happening in Karnataka. We in Delhi ignore the politics of southern parts but this piece has come up with information and opinion. In school books and even by historians Tipu Sultans is regarded as a freedom fighter, but he just fought for his own kingdom and not for Indian independence. Indias histroy was distorted by leftists and congressmen to appease muslims. This is why national leaders after independence chose to promote minority over hindus. In the interest of country, lets leave this religion thing for some time and look for economic benefits of all. No one needs any anniversary, people just want basic necessities. Stop glorifying killers of Hindus and playing politics over them. Congress will be wiped off from Karnataka in next elections. I agree with almost all the facts you’ve mentioned. It hardly matters if Tipu jayanti is celebrated or vardanti is celebrated. Truth can’t be far from the twisted correlation , The population growth is higher in middle income and lower income groups, much of the groups you’ve spoken belong to the same income groups. The growth rate is declining when compared to the past and it is decreasing at high levels from 32% to 29% to the current 24%. The Fertility rate in Hindus has stabilized at 2.7 and for Muslims it is coming down with the current number being at 3.2. The irony in India is that no one wants to know and acknowledge anything more than religion. While Hindus are busy celebrating Shivaji Muslims feel good with Shah Jahan and Akbar. Since Modi has come to power, all Congress moves are looked with an eye of nationalism. Let people celebrate Tipu Sultan if they want, why create scene over everything? 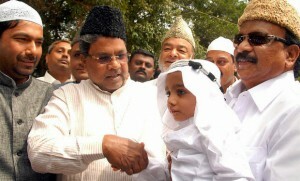 I have even heard that on the sword of tipu sultan, it was inscribed that hindus be killed in the name of allah! How much true is that?